FedEx missed on earnings and revenue expectations, which thrust shares down to vital support. Will it hold? Shares of FedEx (FDX - Get Report) are under post-earnings pressure -- again -- closing lower by 3.5% at $175.07 on Wednesday. Unlike the rest of the market, shares of FedEx have done a really poor job of climbing off the fourth-quarter lows. It's in the bottom 10% of the S&P 500 when it comes to one-year returns, with the stock down about 35% in that span. The silver lining here? That FedEx stock may be rangebound near current levels -- provided it holds vital support. If it doesn't, the range is broken and shares will head lower. But with a top- and bottom-line miss for its third-quarter results, investors don't have much to hang their hats on right now. One-year daily chart of FedEx stock. After its previous earnings report in December, FedEx stock also took a tumble. Investors saw shares gap down from $185, opening just under $170 and closing just above $160. The action now isn't quite as bad, with FedEx stock falling about $10 a share so far in Wednesday's trading session. Still, it's less than ideal and investors were hoping FedEx would deliver more. Considering the report, though, maybe the price action isn't all that bad. Last quarter, FDX stock was hammered after beating estimates but slashing guidance. This quarter, the company missed both revenue and earnings expectations and cut its outlook again. But shares are only down slightly compared to the beating it took a few months ago. The stock is now holding up over $170, a level of support from earlier this month and an area of resistance in January. To say that this level is becoming notable is an understatement. While I wouldn't stake my life savings on this level holding as support, it's crucial for bulls to keep it over this mark. 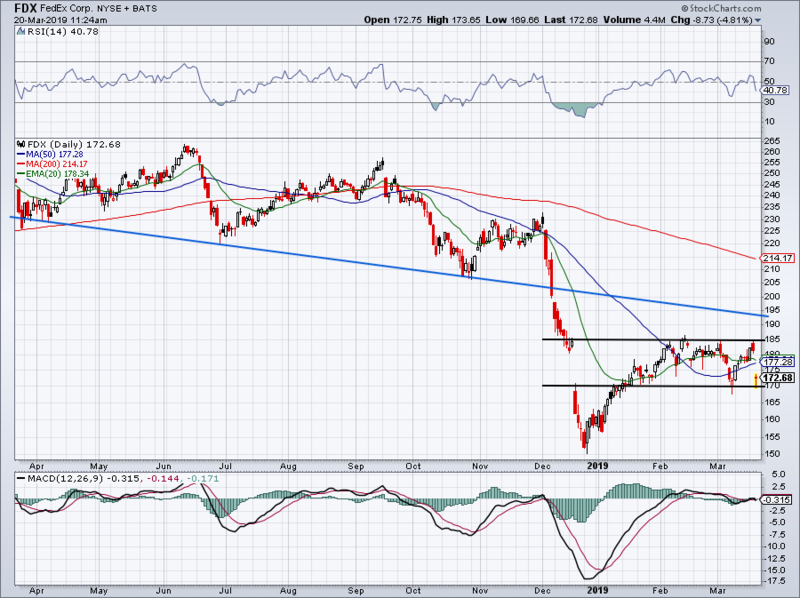 Over $170 and FDX can put together a range between support and $185 resistance. Both the 20-day and 50-day moving averages are in between. The reason why $170 is so important? Because below it and there isn't much support. If it takes out its lows from earlier this month, bears will be looking to press FedEx stock down to its $150 lows from back in December. On top of that, FedEx stock doesn't have an easy path on the upside either, so bulls have their work cut out for them.